Who thinks much about cottage cheese these days? I know that I do not. 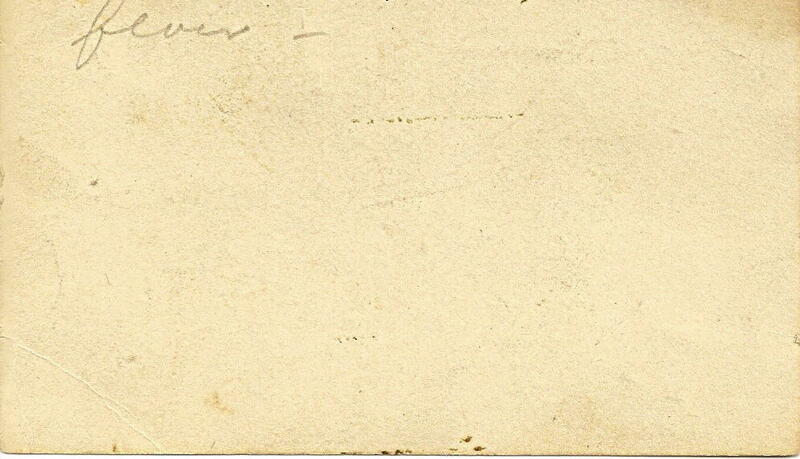 This week’s recipe, from my grandmother Jessie’s recently rediscovered recipe files, features cottage cheese as the star ingredient. Back in the late 1960s and 1970s, cottage cheese was a “diet food”, often combined with iceberg lettuce and flavourless tomato wedges as a standard main course salad in American restaurants. I think gloppy Thousand Island dressing would have been the most popular accompaniment, hardly a low-calorie option. Another purported health food was a leaf of iceberg on a plate, supporting a perfect pineapple ring (canned), on which sat a neat ice cream scoop of cottage cheese, topped with a maraschino cherry. Richard Nixon, President of the US until his resignation in disgrace in 1973, stated that he enjoyed ketchup and cottage cheese together – which seems more like a gore-ish prop for a horror film, rather than a favoured food combination. 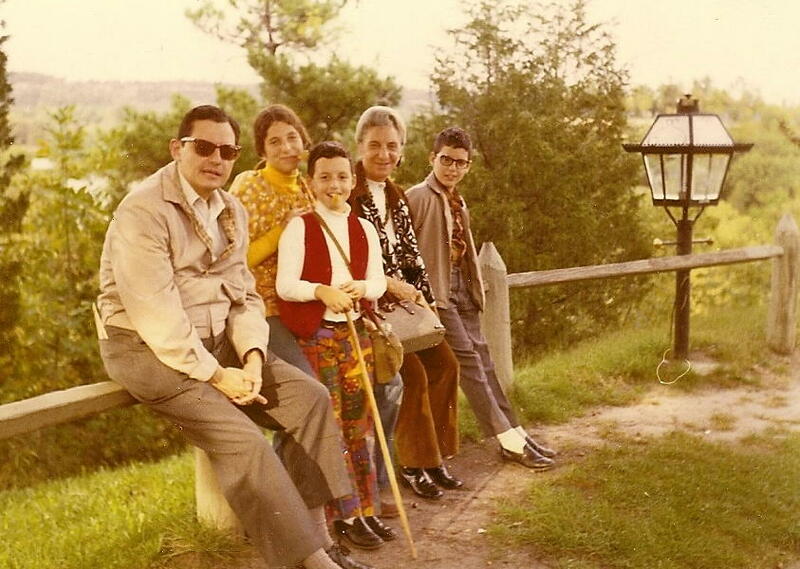 Always fashionable, Jessie is hip (circa 1970) even while visiting at a state park - with my father, youngest cousin, yours truly (as a hippy), and my brother. Around 1970, Jessie was recently widowed, and she seemed to enjoy shocking people a bit. My uncle (Jessie’s son) had given the recording of the Broadway musical Two Gentleman of Verona to my youngest cousin, who was a teen at that time, shocking my grandmother because of its strong language. To prove that she was “with it” or just that she could shock our family even better, Jessie gave me the album from the Broadway musical Hair, lyrics of which I still can recall almost verbatim. I cannot remember if I asked for it (it was my first record album, when they were long-playing black discs, with nothing compact about them). The language, however, was a bit much for a child of seven or eight – even I have to admit. More than Hair – with all its revivals – cottage cheese just is off the radar these days. Perhaps ricotta and artisan curd cheese have eclipsed cottage cheese in the realm of culinary trends: category curds and whey. Jessie, however, always seemed to have cottage cheese in her fridge. 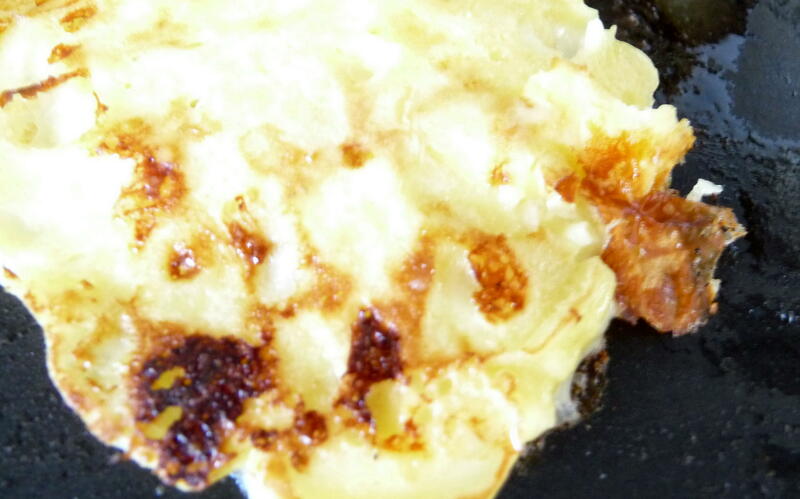 Perhaps it was for salads or to make this cottage cheese pancake. After making this dish, I finally remembered having these pancakes at her place, when I stayed over for the weekend. Nonetheless, this pancake is a bit more sturdy than its Swedish or French cousins with a decided tang, from the sour cream and cottage cheese – which also add a pleasant chewy texture. 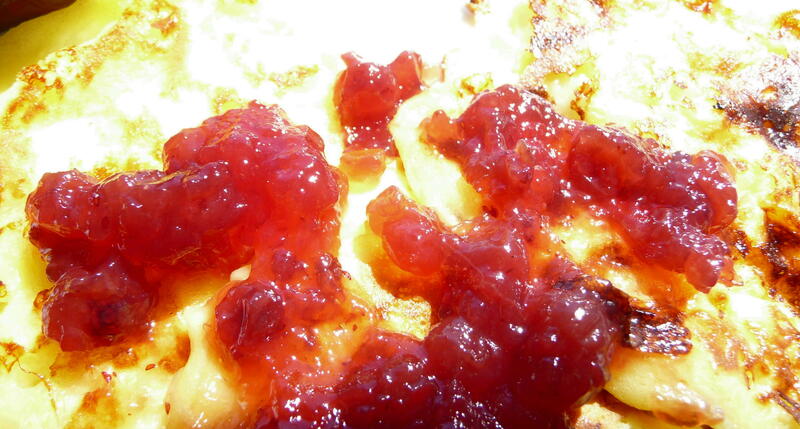 I chose to highlight the pancake’s sassy tang by serving it with lingonberry preserves. One note about making these is that I added a bit more flour, as the batter is very soft and not terribly cohesive; I could not see why Jessie suggested rolling the batter in flour before dropping on the griddle. This technique was messy and did not work for me. Instead, I add one extra tablespoon of flour, though a couple more tablespoons beyond that could help provide more body to the batter. I am not sure about this change and should experiment in the future. So, for a bit of throwback to the days when cottage cheese was king, reigning supreme over ricotta and the like, try these charming pancakes. Drain cottage cheese (unless you are lucky enough to find a “dry” version), by placing over a strainer over a bowl. Pre-heat griddle or frying pan. Mix drained cheese with sour cream. Add sugar, salt, and flour together. Drop batter by soup spoons on griddle, being careful to shape the pancakes, as they are delicate. Turn once the side facing up starts to lose its shininess. Saute until golden brown on the second side. Serve with lingonberry preserves, other sweet-and-sour preserves, or maple syrup and recall the days when cottage cheese was king. 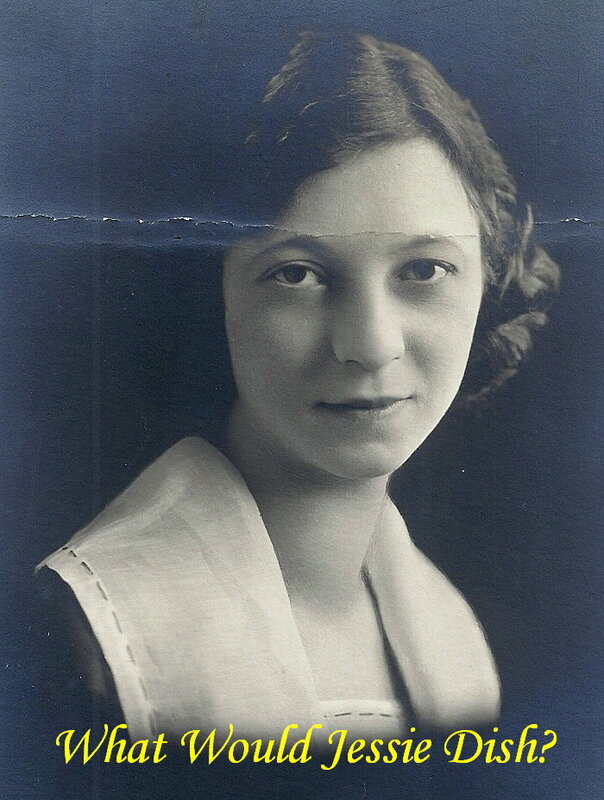 This entry was posted in Brunch, Main courses, Recipes Misc, What Would Jessie Dish and tagged Breakfast, Brunch, cottage cheese, Old-Fashioned Cuisine, Pancakes, Vintage Recipes. Bookmark the permalink. I’ve never eaten cottage cheese because the way it looks makes me think of what food looks like when it’s been regurgitated. That may have just put somebody else off cottage cheese now… oh well. Feel my pain. It is interesting putting it into a pancake, however. I imagine the flavours and textures would be pretty hearty, and chewy pancakes aren’t a bad thing at all. I wonder why Jessie did suggest rolling it in flour? Or if there’s a way to make it less messy…? Hm. Ha, funny that I now have so much faith in Jessie that I try to see the logic in her instructions, even when they apparently make no sense! Thanks, Jax. I think that the flour thing is a bit of a mystery – it does state “4 tbsp. or more” of flour (rather inexact), but Jessie would have known the right consistency. Anyway, you would never know that there is cottage cheese curds in this pancake. And chewy+tangy are a great combo! I hope you’re doing better. 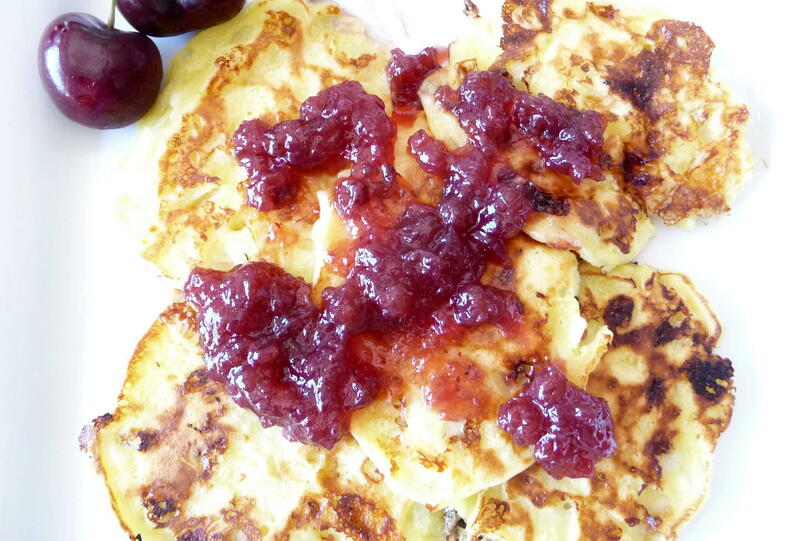 Whenever my dad accidentally added too much milk to pancake batter, he’d call the results “Swedish pancakes.” Kind of a cop-out, though, unless you add lingonberry preserves like you did! These look fluffy and wonderful, and I’m sure the cottage cheese tang is the best part. Hi, Maddie. That’s a pretty funny Swedish pancake story! At least he didn’t try to pawn them off as “crepes”, which would have been more alarming. hi dan! what a great way to jazz up pancakes! i am actually fond of cottage cheese. i can just eat it from the tub with a little bit of fruit or jam. yum! 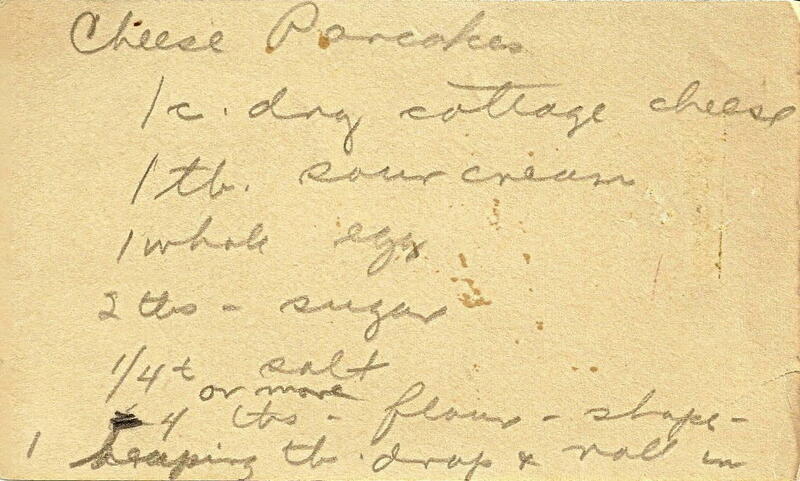 sounds like a lot of history with these pancakes… very cool photos from way back when!